However, the usefulness of antibiotics to medicine is under threat. A national campaign in the UK called ‘Keep Antibiotics Working’ is trying to prevent antibiotic misuse and overuse by making the point that antibiotics are useless for many illnesses that they are asked for (for example, viral infections such as cold or flu) and contribute to the 5,000 deaths a year in England from untreatable illnesses. Still it is poorer countries across the world that are likely to take the biggest toll from antibiotic-resistant infections. In 2014 a UK study predicted that by 2050 the African region will account for 4.15 million deaths a year attributable to antibiotic-resistant infections and the Asian region 4.73 million. The World Health Organization (WHO) is pursuing a similar campaign this week encouraging all countries to think about antibiotic resistance for ‘World Antibiotic Awareness Week’. The theme this year is: &apos;Seek advice from a qualified healthcare professional before taking antibiotics&apos;. One means of slowing antimicrobial resistance is by combating misuse and overuse as proposed by the campaigns ‘Keep Antibiotics Working’ and &apos;Seek advice from a qualified healthcare professional before taking antibiotics&apos;. Other measures include encouraging better hygiene and infection control, surveillance of drug resistance, and reducing the overuse of antibiotics for livestock in agriculture (we at OWID looked at this issue in last week&apos;s post). Vaccines against bacterial diseases reduce the number of infections and antibiotics used as treatment, including the spectrum of antibiotics used for a condition like pneumonia.3 This effect can be enhanced by herd immunity where protection is extended to unvaccinated persons in the population. The most used vaccinations for bacteria are for diphtheria, tetanus and pertussis, usually combined into one injection (DTP). 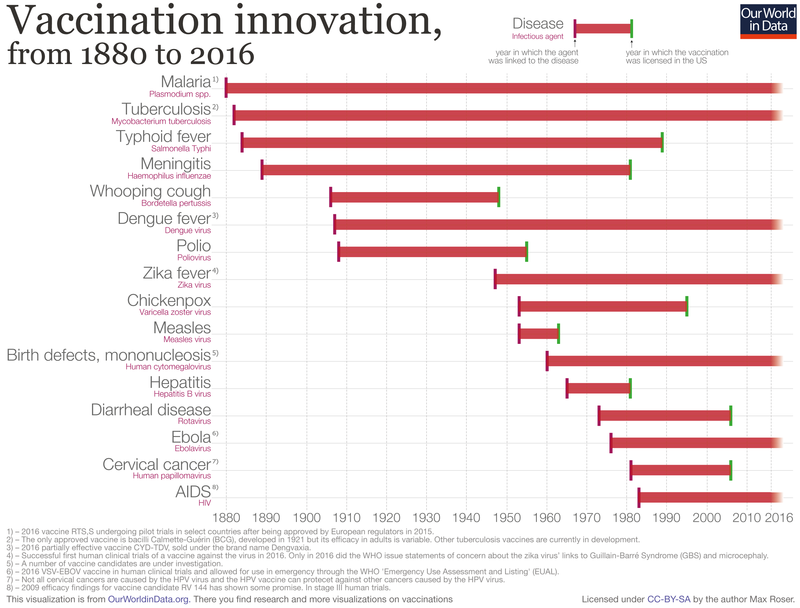 Vaccines that are particularly worth scaling up are for pneumococcus and Haemophilus influenzae type b (Hib), to tackle the approximately 935,000 worldwide of under-5 deaths from pneumonia each year, with these vaccines not yet sufficiently deployed in China, India, Nigeria, Bangladesh, Afghanistan and Indonesia.6 Laxminarayan et al. estimate that for children under 5 years, this amounts to a 47% reduction in days on antibiotics per year with a pneumococcal conjugate vaccine (PCV) that can prevent pneumonia. As the visualization below shows, 11.4 million days of antibiotics could be saved in the 75 countries included in their analysis. No vaccines are currently available for the three bacteria highlighted by the US Centers for Disease Control and Prevention (CDC) as an ‘urgent’ hazard of developing resistance (Clostridium difficile, Carbapenem-resistant Enterobacteriaceae or CRE and drug-resistant Neisseria gonorrhoeae).8 The CDC lists 11 bacteria and one fungus at the &apos;serious&apos; hazard level, and three bacteria at the &apos;concerning&apos; hazard level. A bacteria that the CDC listed as at a serious hazard level was drug-resistant Salmonella typhi, causing typhoid fever (simply known as typhoid). Typhoid is a bacterial disease that infects over 12 million people worldwide each year. The two current vaccines that are available are not suitable for young children nor protective for long periods of time, plus multi-drug-resistant typhoid has been on the rise. We need to pursue a wide range of options in order to deal with antimicrobial resistance, including new vaccines. The TCV for typhoid is a step in this direction. Laxminarayan, Ramanan et al. 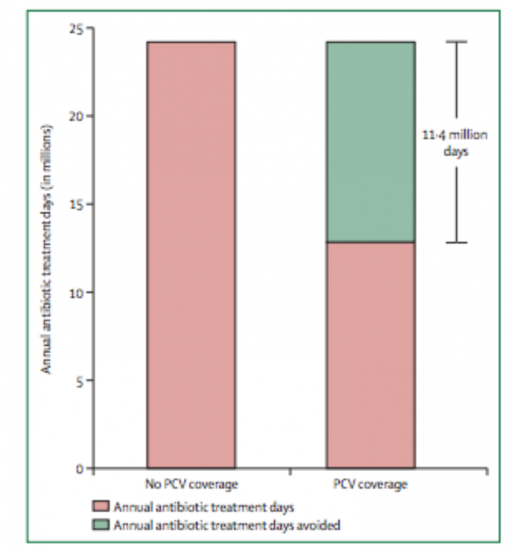 (2016) – Access to effective antimicrobials: a worldwide challenge. The Lancet Volume 387, Issue 10014, 168 – 175. Available here. Bar represents antibiotic days avoided with PCV coverage.